Going into this reread of the series, I always remembered this book the most. It was the image of Laura and Almanzao driving back in the cold winter. Of all the books. this is my favourite in terms of being enjoyable and it feels good. The Ingalls aren’t moving around, things are settled, Laura has grown up so much, and she is happy. There is one scary moment in the beginning, but it’s not as bad as the racism in the earlier books. I just think this is a lovely book about the past. For me, it’s a classic. 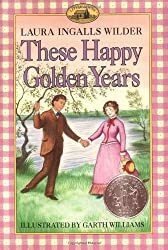 I know that Laura and Almanzo didn’t have an easy life after this, but the book captures a good time. I would reread this novel again. Reread October 16th-17th, 2014 on Kindle. I think I recall her book On the Banks of Plum Creek mostly. But I should look to reread her other titles like this one. thanks. Hi Susan! I enjoyed On the Banks of Plum Creek as well and the Shores by Silver Lake. I had very mixed feelings during the readalong. I have one more book to go, but I definitely think there is merit to these novels as classics. Thanks for commenting!